Speed. The feeling of time accelerating as force propels in motion your very being. A constant state of change as every sense in your body is heightened in anticipation of the next second that passes. Speed is something that is sought after like a drug, igniting dormant endorphins that create an unmatched visceral experience. When sought with respect, it can be euphoric; when abused, it can be detrimental. It is something few get to experience to the heights of their desire, and are thus left only to vicariously enjoy through a select few…. That is, until now. In a world of modern technology that grows at unprecedented paces, Microsoft has developed a racing experience that is the Forza Series. Jordan Butters at Drifted was invited to attend the unveiling of the 4th edition of Forza, but due to being a mere half a world away in merry ol’ England, they generously asked us if we were interested in documenting the event on their behalf. Who are we to decline? Admittedly, Andrew and I were completely unaware of what we had signed up for being that the last time either one of us played a video game was with a joystick. Much to our surprise, this was more akin to a Hollywood premiere then a pack of pubescent teenagers huddled around a plasma screen. No, this was something entirely different. The Forza 4 Premiere occurred at the LA Live Event Deck, with close to 1,000 people turning out for the private unveiling. Walking up to the gala, you quickly forget you are on top of a parking structure as you enter into what seemed like a car enthusiast’s Alice in Wonderland. Quickly reigning in my sensory overload, I began to take notice of the layout. At every corner was a posh mini-lounge. Each lounge had plush leather furniture that surrounded the latest in home theatre technology and displayed various video shorts of the tracks used in Forza 4. Hovering closer, I discovered that it wasn’t recorded video, but individuals actually playing the game! Sincerely, it was as if the player was controlling a live simulation of a real racecar on a real racetrack. To drive home this point, the developers have utilized their Kinect Technology that allows you to genuinely control the movements of the vehicle with no other associated peripheral other then your hands. At this point, I felt misplaced within the world of Tron, so proceeded to acquire a cold b… soda. There were open bars throughout the venue and stationed in between all the various stations were a choice collection of exotics that, even in Orange County, you never get to see. One of the personal favorites on display was eGarage's Koenigsegg CCX. To see this car in person was truly special. The CCX was released in 2006 and stands for "Competition Coupe." The X represents the 10th year of the Swedish car manufacturer's first production CC. For a car company that was created less then 20 years ago to already have this level of heritage is quite seducing. It also doesn't hurt that the CCX can sprint to 200 km/h in less then 10 seconds front a standstill. 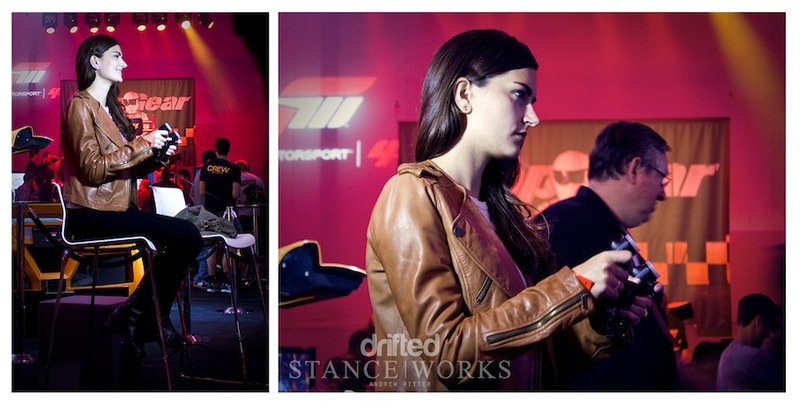 With the display vehicles on hand, you certainly garnered a sense that the Forza team was interested in allowing the game user to experience supercars that few of us ever will. Standing around such exotics as the Mercedes SLS..
To niche supercars like the Gumpert Apollo..
To the ALMS LMP1 LOLA Muscle Milk Aston Martin and Red Bull Hyundai Rallycross Veloster.. 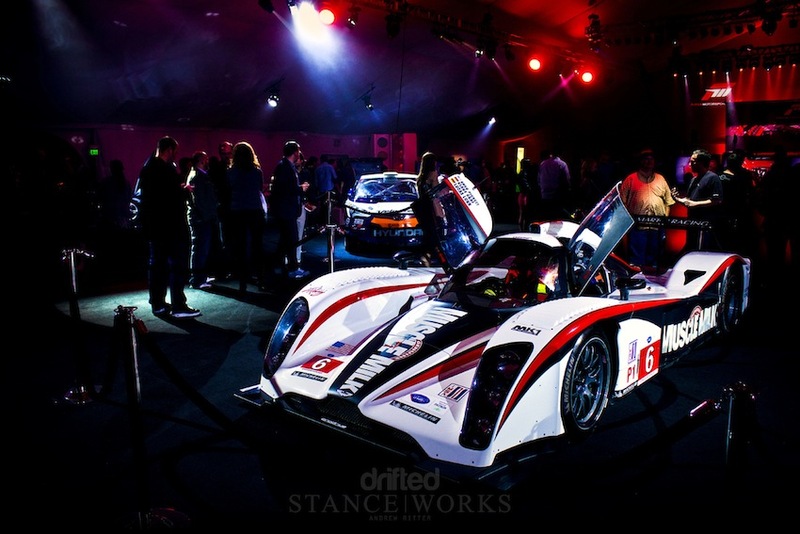 It became resolute that the Forza team had purpose and intention of focusing around vehicles that epitomized speed. 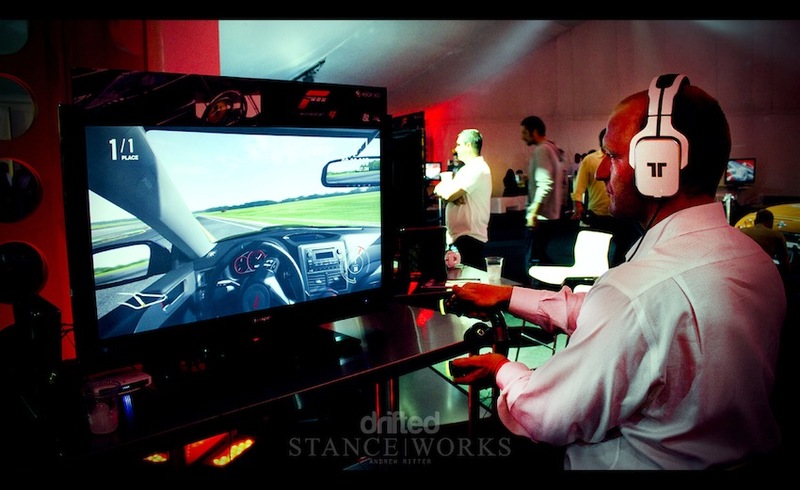 Looking around at the various gaming stations, you could see facial cues go from expressive smiles to stern focus as individuals would begin a racing simulation. 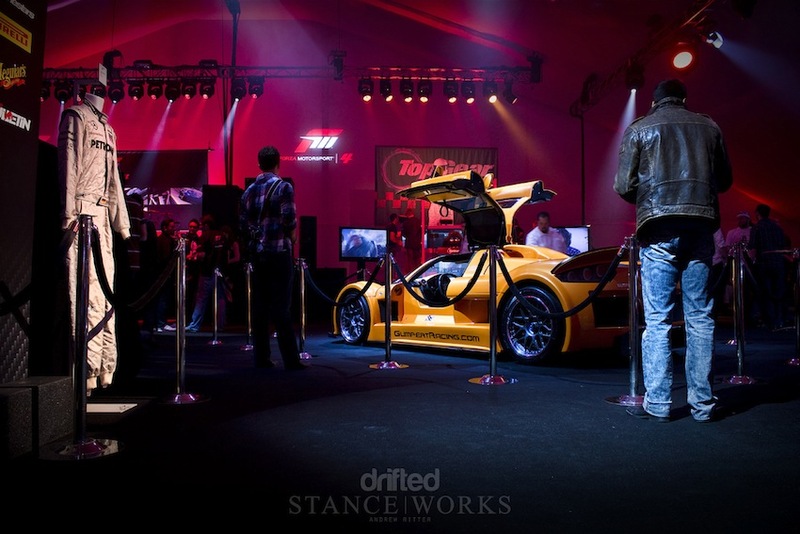 While the crowd was eclectic in age and backgrounds, the common denominator was shown in each individual that engaged in Forza. Focus heightened, muscles slightly tensed, vision acute and heartbeats elevated... your psyche was lost within the world of the Nuremberg. 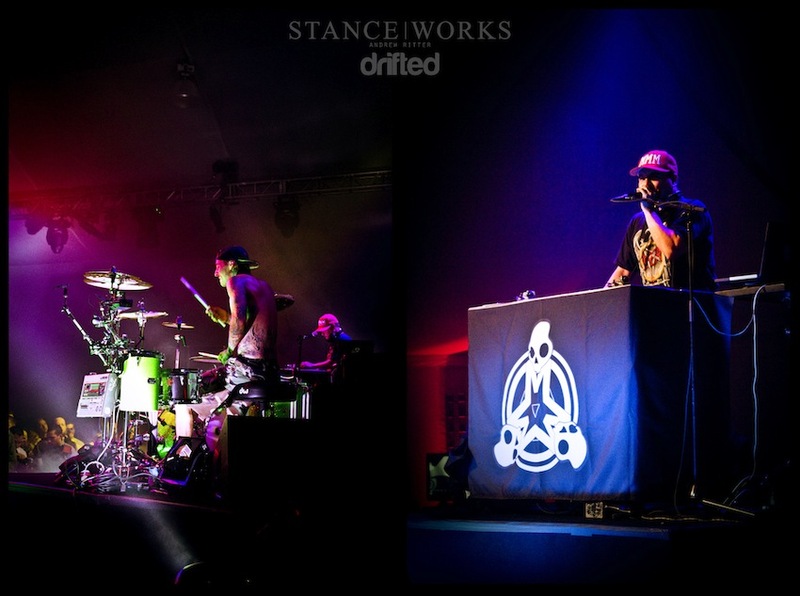 Vicarious living was in full effect, as tension rose with every passing corner taken. To watch the mental shift of each user was simply mesmerizing. The surroundings didn't matter. It's as if the player was in a silent cube, with all their focus and emotions tied into each lap that passed. You didn't even have to watch the screen to know the success of a turn, with reactions fully transparent. Smiles would give way to dismay, as the individual would learn that a certain level of skill set would have to be obtained in order to master the careful balance of speed and restraint. From deep focused racing experiences to scheduled festivities, the night was full of great entertainment. 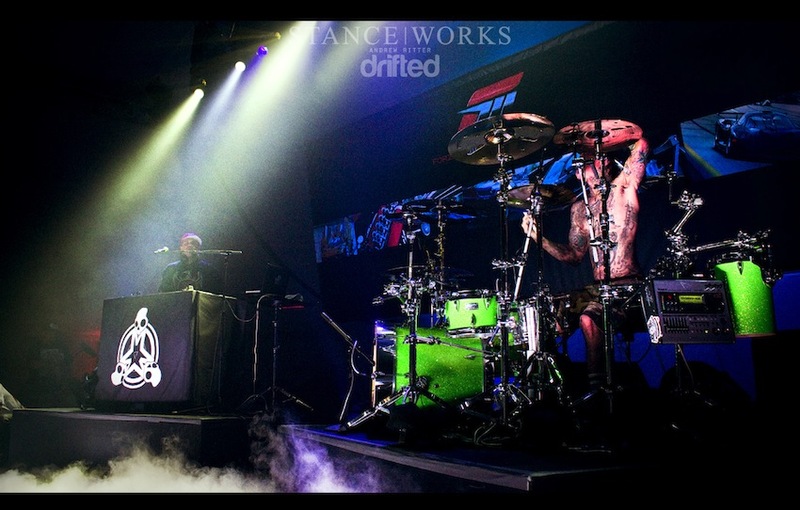 To top the night off was a special guest appearance from Travis Barker, of Blink182 fame, and Mix Master Mike as they proceeded to demonstrate their skill set via a live performance. To say this was THE event of E3 week, would be putting it mildly. While I'm not a gamer, I can see the grand appeal in getting in front of a display and submerging myself into the world of testerone-induced speed that Forza has created. If there is one thing that is apparent with Forza 4, it's that the developers have acknowledged the desire of auto enthusiasts in creating a pulse-pounding experience that bridges the gap of impossible and reality. If you have the slightest inkling to taste what yearns in the recesses of your raw human nature, then prepare to challenge yourself with Forza 4. 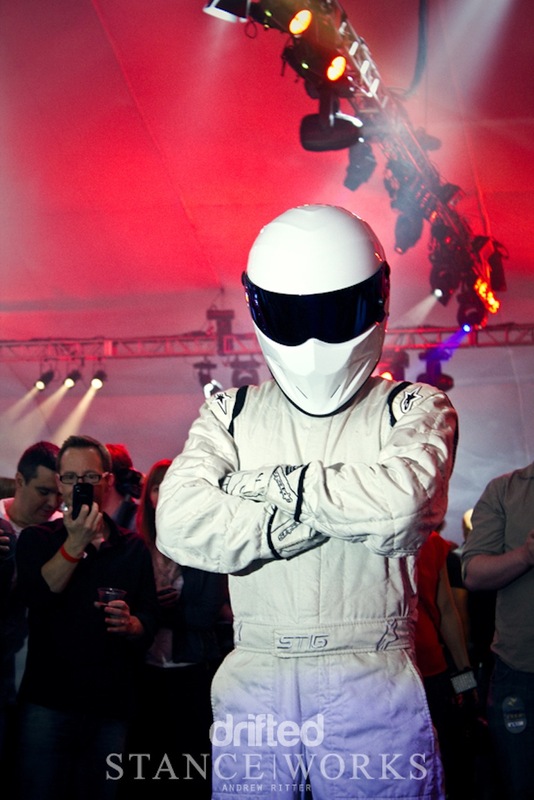 If the Stig can get behind it, then you know you're in for a wild ride.